Greenland’s first female prime minister, Aleqa Hammond, on climate change, boosting the economy and the tough decision to lift the ban on uranium extraction. All part of the ongoing development towards a new, independent, Greenland. The world’s largest island is undergoing major change. While global warming causing the ice cap covering most of the country to melt rapidly is of great environmental concern, the icy winds of economic and political change are blowing too. “We are the last frontier of a nature that you don’t see anywhere else in the world. And we have the obligation to protect that”, says Aleqa Hammond, the nation’s first female prime minister, in an exclusive interview during the Economist Events’ Arctic Summit in London this month. Ms Hammond opened the summit, throughout which Greenland was a recurring topic, with a keynote speech declaring her country “open for business”. Government officials, arctic investors and academics had gathered to discuss the balance between preservation and economic development in the Arctic. Speakers warned that a lack of strategic thinking and preparation could lead to a waste of economic potential and damage to the pristine Arctic environment. Ms Hammond agrees the threats are there, but she is not worried. Instead, she speaks with confidence about her nation’s journey towards a booming economy and, if all goes her way, sovereignty. Although still partly governed by Denmark, the nation voted yes to greater sovereignty in 2009, and since 2010 has had control over its own mineral resources. Last year, in a 15-14 vote, the government abolished a zero-tolerance policy towards the mining of uranium and other radioactive materials which empowered them to fully exploit their rare earth deposits. At present, China has a near monopoly in producing many of the rare earth elements that are vital to some high-tech industries, such as the production of mobile phones, but this could now change. 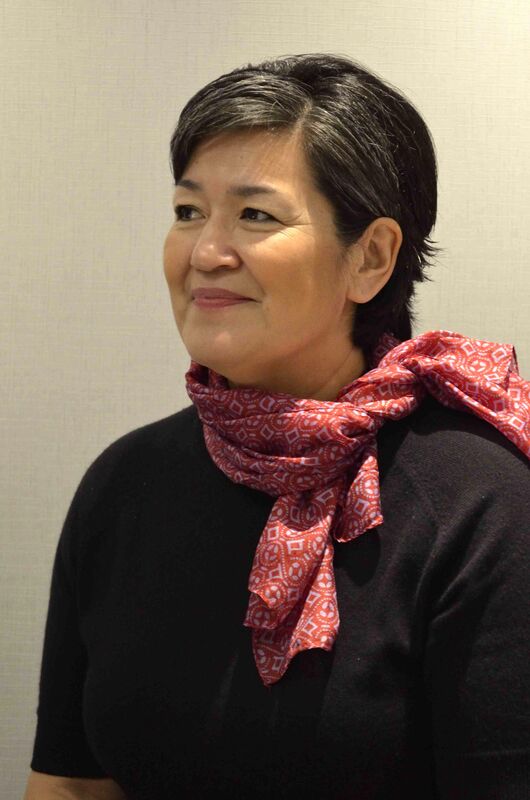 But with new business come environmental concerns for what is perhaps the most unspoiled environment in the world: “Protecting the Greenlandic environment has always been a top priority for our government and measures must be taken to ensure this,” she says. She says: “I don’t mind setting the highest standards required for protection of the environment for mining in the world. Maybe Greenland can set new global standards. Because we live in a country that is very dear to us. If it wasn’t for the environment and what the environment gives us, we would never have survived”, she adds. Ms Hammond explains how the people of her country are experiencing the biggest changes since they first settled on the island some 4,500 years ago. London Mining, a British mineral company, is planning a £1.5bn iron ore mine in South West Greenland which was given the go ahead by the Greenlandic government last year. The project, once financed, could result in the company bringing in more than 3,000 Chinese construction workers into the country to build a port and pipeline to serve the mine. London Mining has said the reason for bringing in Chinese companies is to cut the costs for the project which they are currently trying to attract investment for. Greenland, the world’s least densely populated country, has 56,000 inhabitants and a workforce of only just under 27,000 people. With many not trained within the mining industry, and a threat of foreign companies bringing their own, cheaper labour force to do the jobs, will these potential mining projects really benefit Greenlanders in the end? Ms Hammond talks about her approach with confidence as she explains that Greenland will not be doing business with companies who do not follow very strict guidelines set by her government. “If they are to come here, we set the terms”, she says firmly. Another concern is foreign workers getting paid Chinese rates. Ms Hammond says that will not be the case: “My government is not in doubt: they will get the same wages as our own people, and nothing less. It is clear Ms Hammond will not compromise with the still-to-be-formed mining sector. The negotiations will also include ensuring the foreign labour force pays tax in Greenland and not the country from which they are from. But numbers aren’t the only problem. Educating Greenlanders quickly is vital for the economy too. Ms Hammond says: “We have created a school for mining which we are privatising to get more funds to get as many people educated as possible”. Mining is only one of the ways businesses are planning to exploit the non-living resources of the Arctic. Licences for exploratory drilling for oil and gas in the waters off Greenland have been issued to BP, Shell, Statoil and others for a while now. If oil is found, extraction is still 10-20 years away. But these projects have sparked concerns about damage to the arctic environment in terms of oil spills, pollution and emissions from the heavy fuel oil used by vessels in the arctic waters. Another concern is how “the race for the Arctic” and industrialisation will contribute to further global warming by the extraction and increased usage of non-renewable energy sources. For a country which is made up almost entirely by an icecap which is up to 3 km thick and contains ten per cent of the world’s resources of fresh water, the fact that the ice is melting rapidly is of the utmost concern. Contrary to uninhabited Antarctica, where conservation and preservation of the environment is of great concern, it’s important to remember that there are 4 million people living in the Arctic and their voices need to be heard. She says she is confident the Greenlanders can handle the ongoing transition from the old inuit lifestyle to a modern society, or from the old to the new world, as she calls it. Protection of the arctic environment and preservation of the old world, including whaling and seal hunting, is of great importance to the people of Greenland, and to Ms Hammond. Already in her lifetime the country has changed radically. Now 47, she grew up in a small settlement without running water or central heating, which is how most people lived at that time. Today 48,000 Greenlanders live in towns and about a quarter of the population live in the capital, Nuuk. When talking about her childhood, the tone changes and her voice softens. Although a modern, widely travelled and multilingual woman today, (she speaks 5 languages) she remembers well what it was like to grow up in a very different Greenland. And options are of the greatest importance, she says: “An option to work here or there, or maybe a bit of both, or even change jobs during a lifetime is very important. Having an economy based on one source only is very stressful for the families, and for the national economy. “I’d like to see the economy of Greenland grow so that people can keep the right to live where they live and also we as a country can afford to have people living in as many places as there are now without having to tell people they have to move. What is causing the ‘social pollution’? How have the Greenlanders reacted to the developments so far? The nation is tackling high alcoholism, unemployment and suicide rates. Ms Hammond is aware of these issues, which have been referred to as ‘social pollution’, and says it is of the utmost importance that the Greenlanders feel included and can make decisions for themselves. “I have lost very dear friends. Children I grew up with have committed suicide. It’s not just one, it’s several. I have seen at close hand how for the last 32 years more than 3,000 people have committed suicide. It’s like a whole village is gone. Ms Hammond, who was reserved and factual at first has now warmed up. These questions have clearly tapped into something she holds very dear to heart. This is a shorter version of an article I wrote for The Ecologist in March 2014.